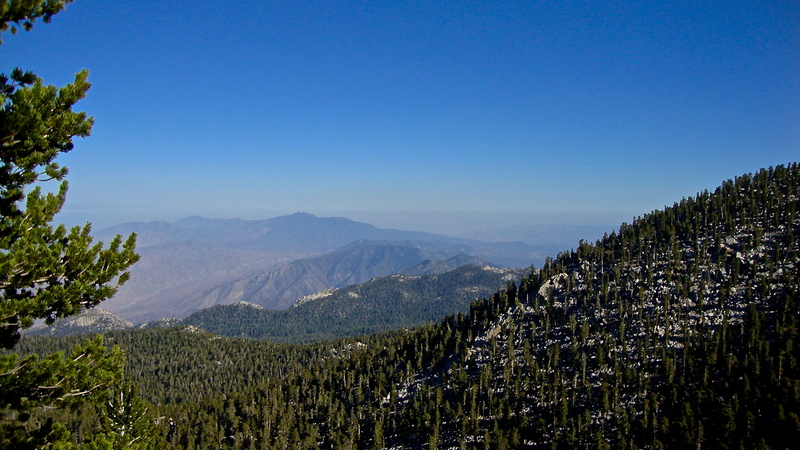 Marion Mountain Trail to San Jacinto Summit. JMT, We are Ready. Approximate elevation: Trailhead-6,400ft., Top of trail-10,834ft. The last time we hiked Marion Mountain Trail was in April/May of 2012. Snow covered a good portion of the trail above 8,000 ft, and we only made it to the junction. 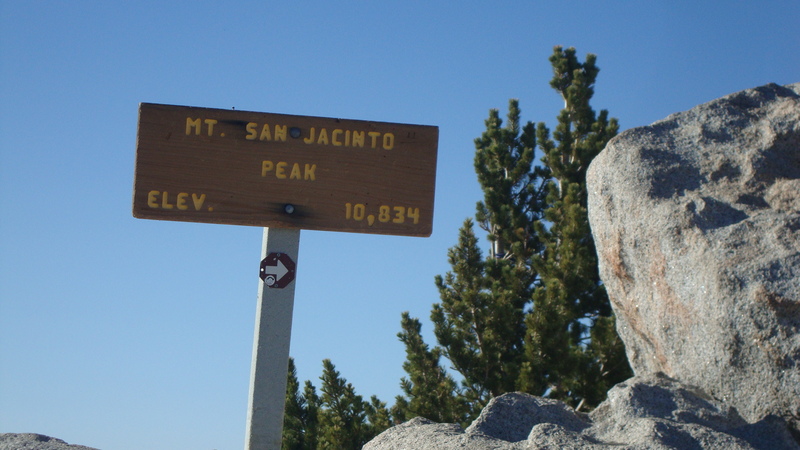 It is known as one of the shortest and steepest routes to the summit of San Jacinto. We took my brother on this hike as a warm up for the JMT at the end of the month. this is a challenging trail with difficult terrain. You must keep a sharp eye out for the path as it gets tricky. Less than half a mile into today’s hike, I came within a foot of a Pacific rattler, who warned me in the nick of time. My hiking pole was inches away from his tail. I backed away slowly to allow this 4-5 foot adult make his way up the slope. Close encounters with rattlers gets the adrenaline going. The color and pattern of this one blended in perfectly with the trail. While I’ve had over a dozen encounters with rattlers in my few years of hiking, this was the closest. Our altitude was approx. 6,700 ft. 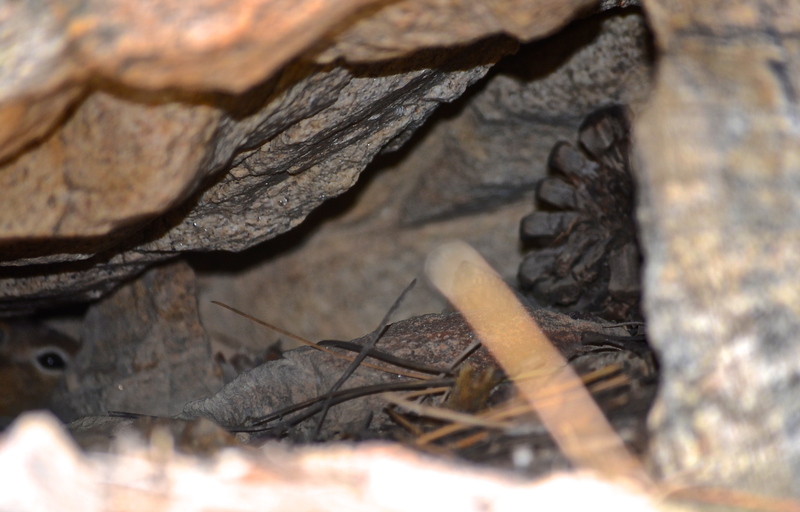 In my observation, snakes are rarely seen above 8,000 ft. in the San Bernardino Mountains. It made me more cautious the rest of the day and I also took the time to brief my hiking partners on how we would handle a poisonous snake bite situation. 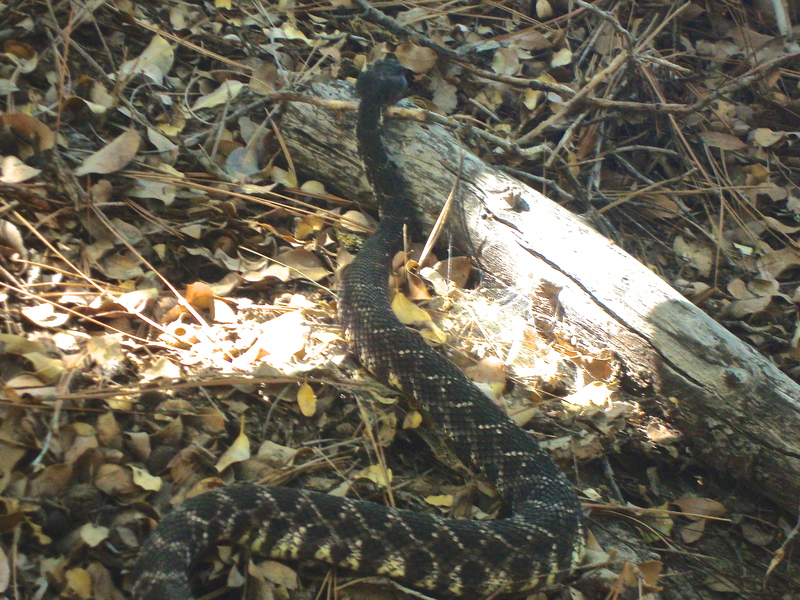 Crossing paths with a 4-5 foot Pacific Rattler. After snapping a few photos of this viper, we focused on our journey to the summit. The trail wastes no time in elevation gain as it climbs out at over 900 ft. per mile. The short switchbacks and rocky, sandy trail makes for a calf and quad burning extravaganza. Due to the lack of snowfall last winter, the vernal streams are fewer and water flows much less. The first significant stream was around 9,300-9,400 ft., and probably feeds into the tiny San Jacinto River. The temps stayed in the 80’s for much of this trek and we were using up our water faster than predicted. There were a couple of other streams where a someone with a pump could extract some water. Sometimes, I question why we do these tough hikes. Marion Mtn is one of the hardest ones around. It’s really mind over matter because it isn’t always fun. It does build confidence in the sense that once you put your mind to something, you can conquer it. Besides, if you always hiked on flat terrain it would be boring. We took a lunch break at the junction of the PCT/Marion Mtn/Seven Pines trails. From the junction, you enter a heavily wooded area for 1/2 mile and begin a steady climb that is exposed to afternoon sun. The trail is rocky with occasional shade under some conifers. We continued on to Little Round Valley campground. 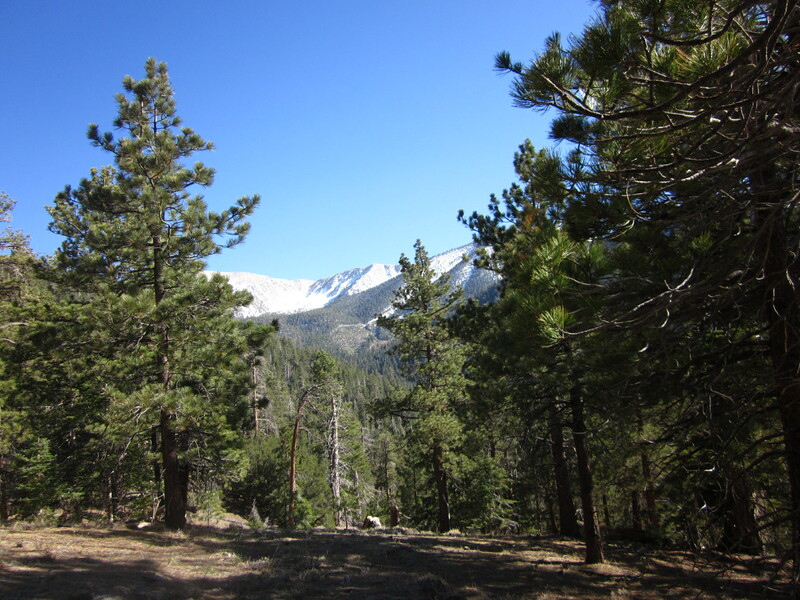 It is a nice area with private campsites less than a mile to the summit. The nearby vernal stream was pretty much dry, so I recommend you top off at the stream about 700-800 yds before camp on the ascent. We broke out into a clearing with signs that pointed us to the summit and points to the tram, Wellman’s Divide, Deer Springs Trail and Humber Park. The views to several 10,000+ peaks and the desert below are beautiful. 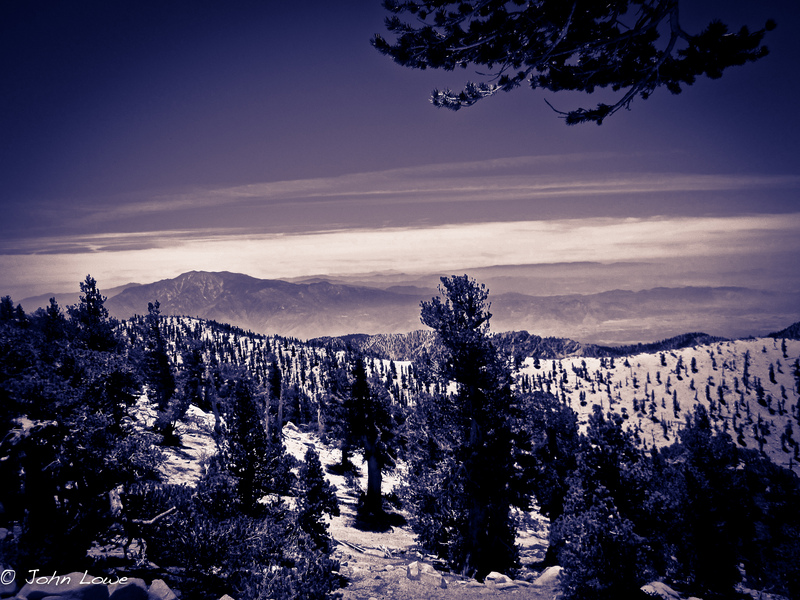 No hike to San Jacinto is complete without stopping by the summit cabin. The last 200 ft. to the summit are spent scrambling up boulders and around the flora. At the top, we saw several others – not too bad. Sometimes, you can run in to 30 or 40 people crowded around the sign. It was 5:30 by then, so that might have something to do with it. We started down by 6 p.m. knowing that it was going to be a close call on darkness. I have to admit, this trail is no easier going down since you have to pick your way around the rocks and scree. We burned through our food and snacks due to the extra effort going up. Now, we were on auto pilot. As darkness approached, we broke out the headlamps and realized we would be hiking for at least another hour. The forest and moonless night made for a slow descent as we picked our way over the obstacles. My headlamp needed the batteries replaced, but I kept going. I did have spare batteries, but just didn’t want to stop. After a week of night hiking the 100 Mile Wilderness last year, this wasn’t too bad. My hiking partners weren’t digging it though. Actually, I was tired and ready for it to end too. If you’ve hiked this trail, you know how hard it is to follow – especially at night. As Mary discovered, the scorpions come out at night here. While I was struggling to see the trail ahead, she was seeing every crawling critter on the path. Oh well, at least the scorpions are small. After 1 1/2 hrs, we finally reached the parking area and were dog-tired. We were still committed to the post-hike celebratory meal of In-N-Out with “animal style fries”. Well, if you live out here – you know what that is. This hike is a great workup for a Mt. Whitney type trip. We used it as a warmup for the JMT. Even though the trail humbled us, we came away confident with a few lessons learned. 1. Take more water than you think you need or have the ability to filter some. For me that’s 1 liter for every 3 miles. Your mileage may vary. I carry a backup 24 oz. Camelbak bottle and needed it on this hike. 2. Take extra food and snacks. While we had enough, it wasn’t enough if we had gotten lost and needed to spend the night. Keep some of those nuclear proof classic Clif Bars in your emergency pack. 3. Hiking at night is slow going, especially in tough terrain. Scree isn’t as obvious and a rolled ankle 3 miles from the trailhead is a bad thing. We use trekking poles when hiking. This is a good set that is reasonably priced: Kelty Upslope 2.0 Trekking Poles, Ano Blue Unless you are a pro, don’t spend your money on the carbon fiber poles. It’s funny how much time you waste piddling around the campsite. By the time we loaded up, it was almost 9 a.m. We had a 7 mile descent ahead. Other than the difficulty of carrying a full load uphill, going down is harder. You tend to slip more and your toes feel like they’re coming out the front of your shoe. The talus was steep and the trail angled, which caused us to compensate by putting more weight on the uphill foot. It was slow going but we were ready to finish this. The focus required to maintain footing was intense. When you think about every step on this terrain being calculated, your brain gets a real workout too. The volunteer trail crews have done an amazing job out here. On a previous scouting hike of Momyer Creek Trail, I counted no less than 10 blow-downs blocking the trail. By Memorial Day, they had cleared them all. Sometimes, I will make a note on the position of a trail issue and report it back to the ranger station on the way out. The hiking community is tight-knit and are good stewards of the trail. By noon, the exposed areas on the trail were heating up. It was a blessing to go in and out of the forest as the temps would drop 5-10 degrees in the shade. Toward the end, we started to run into day-hikers and people who seemed to be out for a stroll. As we neared Mill Creek, we heard groups of people and lots of kids. We passed a family heading uphill, their daughter asking us “where the river was?” “River? Oh, you mean Alger Creek, it’s 3.7 miles that-a-way.” I doubt they made it that far as they towed an elderly woman who was inching along. They also had their sodas and snacks in a clear trash bag. Please don’t take me wrong, I don’t mean to make fun of them, it’s the contrast between a few days away from society and being thrust into an urban picnic. We came across another family and after we told them about our 27 mile hike, the daughter asked to take our picture. Of course, we agreed. Wow, we were puffed up now! We entered Mill Creek Wash and the atmosphere was that of a park, with people gathered around the creek, umbrellas, blankets and picnic supplies. It was too much for us – as in culture shock too much. Civilization smacked us right in the face. What we saw as a simple wash with a creek running through it became a beach front resort to the people of metro San Bernardino. After getting back to the car, we laughed for a long time about what we just witnessed. Imagine, going into the backcountry for a few days without having time to acclimate to society. We still giggle about it. In the end, our trip to Gorgonio was hard, but great practice for the JMT. Time spent together as a couple was primo. Taking the bear canisters gave Mary an idea what it was like to pack everything (including trash) in a can. 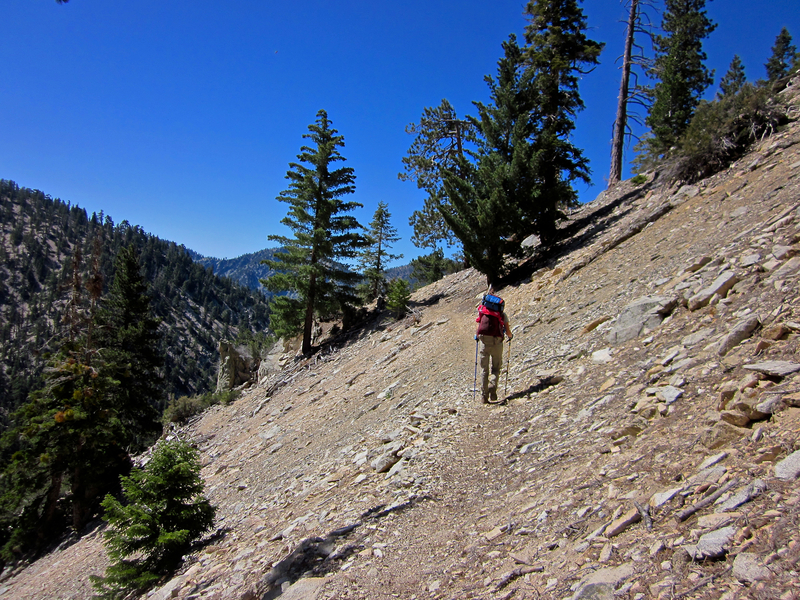 One more hike up San Jacinto and we will be ready for one of the best treks in the country. Day hiking is definitely a good way to warm up for section hiking. Just like car camping is a good way to warm up for wilderness camping. At least that’s how we approach it. The first day up Momyer Creek Trail was a challenge. With 3,000 ft. of elevation gain and difficult terrain, we were ready for a quiet night. Our first task after getting camp set up was to get water for dinner and the next day’s trek. I’ve had a Sawyer 2-bag water filtration system for a few years now and it is dependable, albeit a bit bulky for two people. It does require an adequate water source and doesn’t work well in small puddles. The gravity feed from the dirty bag to the clean bag through the filter is slow and takes awhile to filter 6-7 liters. Dinner consisted of dehydrated meals. Mountain House makes some decent ones that are fairly palatable. We use the portable Pocket Rocket stove with propane-butane fuel. Also found a MSR knockoff stove to use as a backup. We settled in for the night into our tent as the temperature dropped quickly. After a full day of hiking, it’s amazing how fast you can go to sleep. The first night takes some getting used to, kinda of like sleeping in a strange room or hotel. Zzzzzzzzzzzzz. At first, the sound of the helicopter was distant as we heard it pass through nearby canyons. Suddenly, the sound of the blades were overhead, followed by a bright searchlight. I was like, what the heck? I unzipped the door to the tent to see what was going on when the searchlight illuminated me like a Sci-Fi movie where the spaceship beams you up. 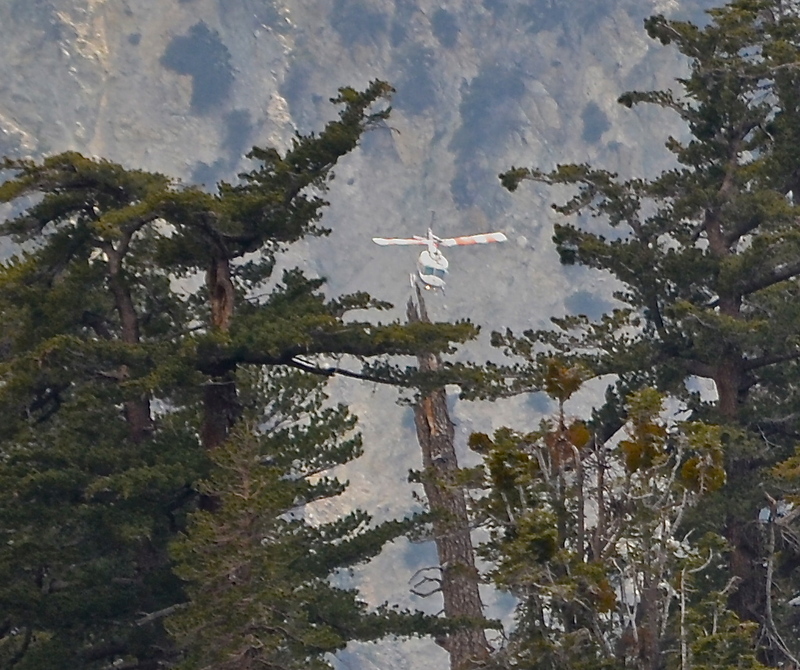 The pilot announced through his speaker that they were looking for a lost hiker. I shook my head no, and the pilot proceeded a couple of hundred yards uphill where he lit up the camp were the boy scouts were. This continued for about 10 more minutes and then it was gone. That was midnight. The rest of the evening was uneventful. We never did find out who was lost. 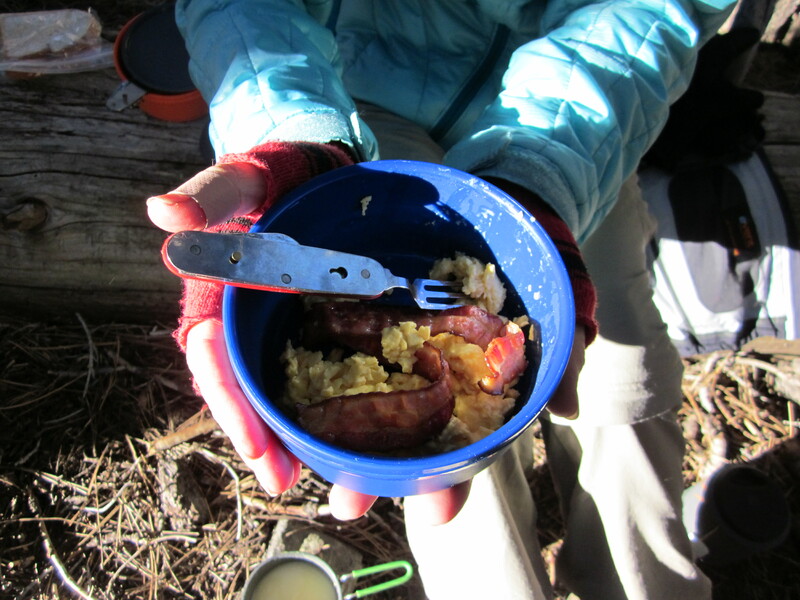 Morning was brisk and breakfast consisted of crystallized eggs and pre-cooked bacon. Crystallized eggs, sounds yucky huh? Actually it is one of the best inventions in a long time when it comes to freeze-dried type food. I don’t know how they do it, but when mixed with water and cooked in a skillet, it is exactly like scrambled eggs. Well, they are eggs. The pre-cooked bacon was also near normal taste and texture. Overall, a tasty breakfast with hot tea. Maybe coffee next time. Today, we would hike from our base camp at 8,400 ft. to the summit at 11,500. 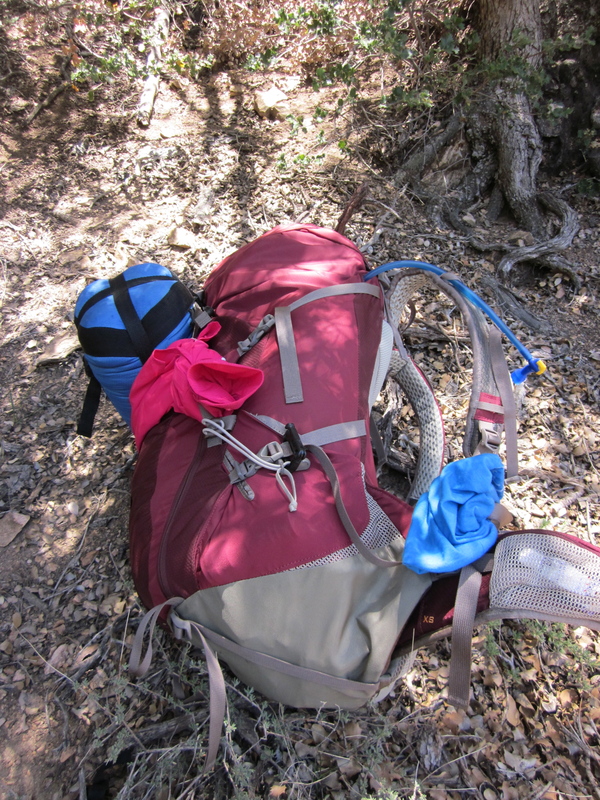 I had Mary drop her main pack and carry a Camelbak hydration pack that I use for mountain biking. I dumped most of the stuff out of my backpack and used it to carry our days’ supplies. We hit the trail and continued through a sub-alpine forest before emerging on the edge of a meadow. Another small stream a mile away provided the last water until our return leg. Crossing above Plummer’s Meadow, we would see the first of many awesome views that day. The switchbacks up to Dollar Lake Saddle junction were steady and steep. This portion of the trail gained about 700 ft. per mile. At the junction, we ran into a group of boy scouts trying to melt some snow. They had quite the quandary as they did not bring adequate water with them for the summit. It takes a lot of fuel to melt snow and in the end, I believe they failed to make the top that day. Planning, especially water – is everything on this mountain. 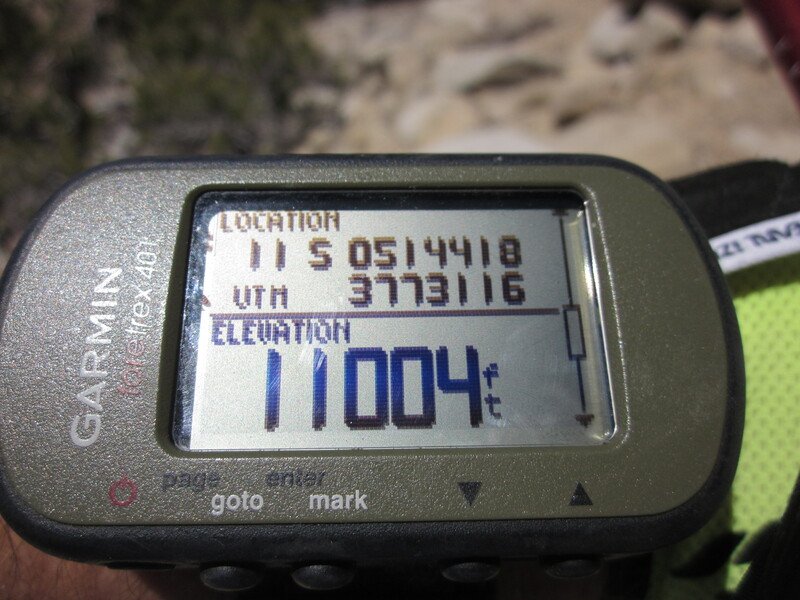 As we continued, the elevation ticked off, 9,000, 10,000… No altitude sickness today. It helped that we camped above 8,000 ft. last night to get acclimated. Acute Mountain Sickness (AMS) is nothing to mess with. It could begin with a persistent headache, nausea or dizziness and can affect the healthiest of people. Don’t confuse it with a hangover because the symptoms are the same! For a mild case, often hydrating and a couple of ibuprofen help. For persistent or worse symptoms, the only cure is to descend. We could see Mt. Baldy on one of the switchbacks and the views only got better. We passed through the last trail camp and the tree-line was around 10,700. Up the next switchback, Mt. San Jacinto came into view. The closest of the Three Sisters, its’ majestic peak stands out as a sentinel to the sprawling desert below. Streaks of snow remain at her higher elevations. The trail intersected with Vivian Creek Trail, the shortest-steepest route to the summit. We began to see more people as the trails converged on the summit like freeway ramps. Near the summit. I was dragging at this point. There are several false summits along the way. 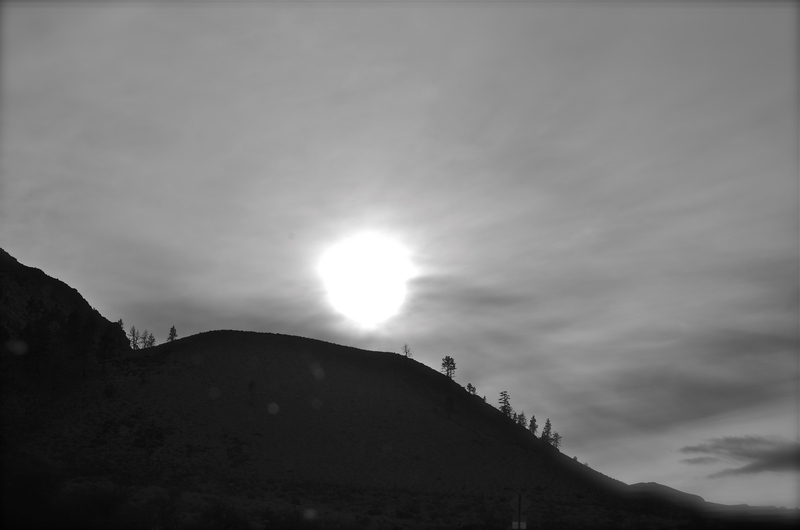 Unless you’ve been there before, each view to a taller hill appears to be the top. 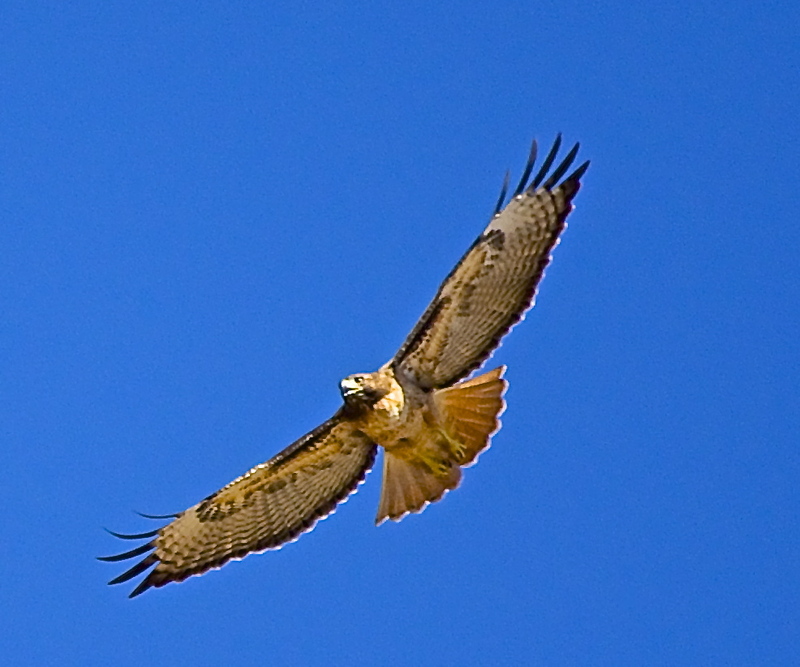 It’s only when you see people nestled in the boulders like eagles on their nests do you realize you are there. We would take our pics, write in the journal, text our families and have lunch right there – only feet away from people you’ve never met before. The summit had a celebratory atmosphere to it, with everyone smiling and quietly chatting. 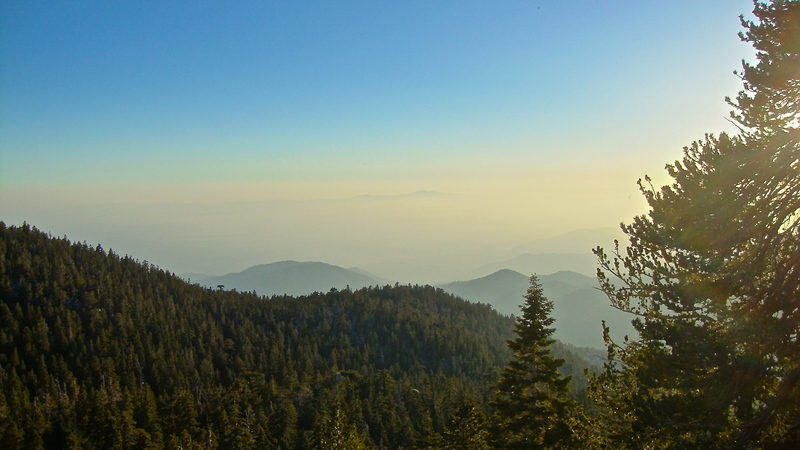 You could see for miles or as far as the L.A. smog would let you see to the west. It actually wasn’t that bad today. 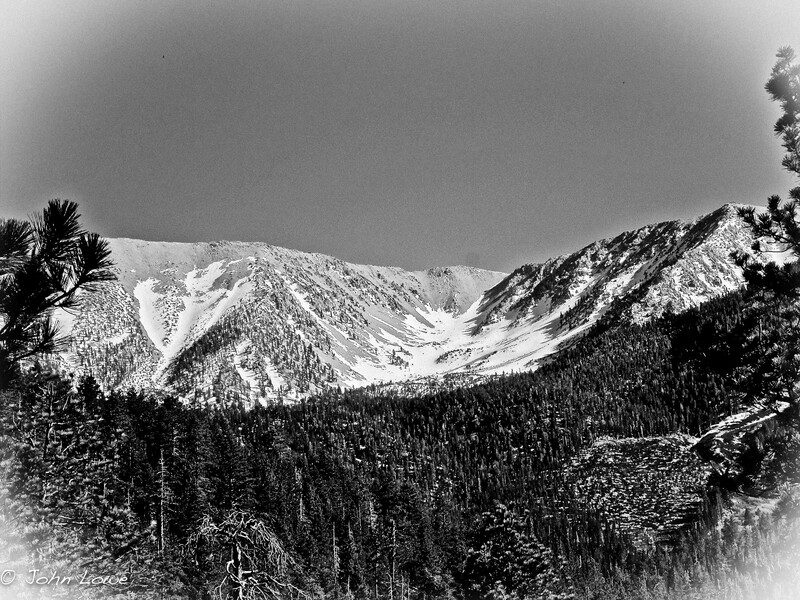 Big Bear Lake to the north, the high desert to the east and the Peninsular Mountain chain farther south. By the time we left, there were over 100 people up there. Oh well, it is Memorial Day weekend. The six-mile trip down was pleasant as we would run in to a few more people making their way up to camp at the top. We did not see anyone else after two miles. The constant downhill was harder on the feet and we took a “foot break” at Dollar Lake Saddle. There was a cool breeze as we aired out our socks. The pounding takes a toll on your arches and toes. By the time we got to camp, we had logged 12 miles and were ready to eat dinner and crash. After filling up our reservoirs at the creek, we had a spicy Mountain House chili meal. It was actually pretty good and one bag was enough for two people. Well, one hungry dude could probably eat the whole thing. After cleaning up, we nestled into the tent around 8:00 with the intent to relax and read a bit. By 8:30 we were in la-la land. I would be awakened some time later by a bright light next to my head on the outside of the tent. “What is that?” Mary was like – “huh?” I said “that light, what is it?” The flashlight in my backpack pocket must be on I thought. I unzipped the tent and stepped out into the chilly night air. The full moon in all its’ glory had crested the ridge and lit up our tent like the spotlight from the rescue chopper. We laughed and went back to bed. The wind picked up a bit that night and made a soothing sound as it passed through the conifers on the exposed ridges. Soothing, but a bit eerie as the pitch would vary. Our campsite was on a downhill slope and not affected by the wind. Eventually, we would drift off only to be awakened by the woodland birds at dawn. Most were pleasant to listen to, except for the woodpecker. 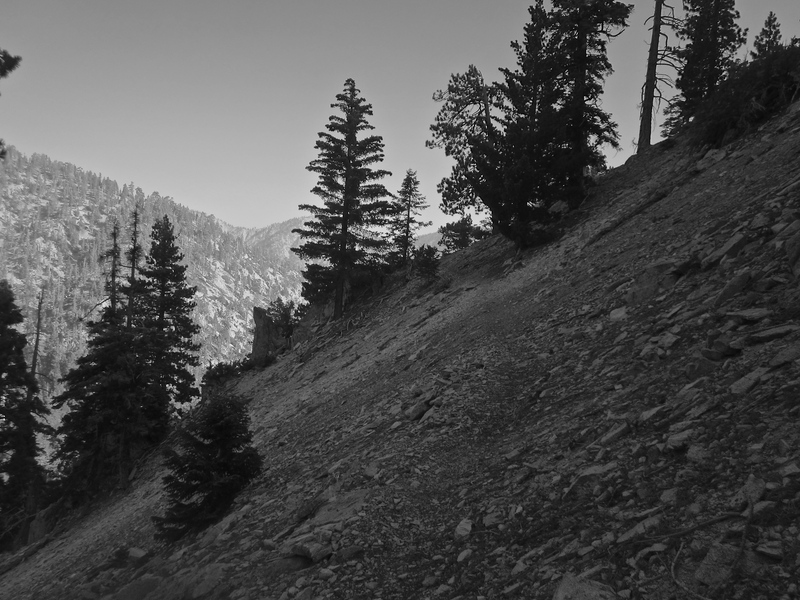 Next: Mount San Gorgonio – A Three Day Journey – Day 3: Talus Is Hard To Walk On. 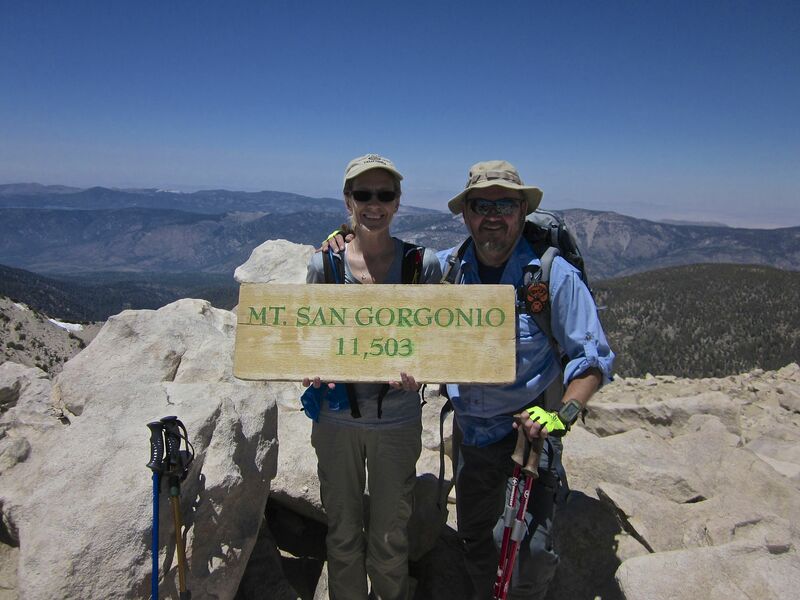 As part of our workup to a section hike of the John Muir Trail this summer, Mary and I decided to do a 3 day practice hike to the summit of Mt San Gorgonio via the Momyer Creek Trail. The tallest of the Three Sisters (San Antonio, San Jacinto, San Gorgonio) it stands out at 11,503 ft. Southern California isn’t necessarily known for its’ majestic mountains, but these peaks are often used to warm up for longer backcountry trips into the Sierras, especially Mt. Whitney. 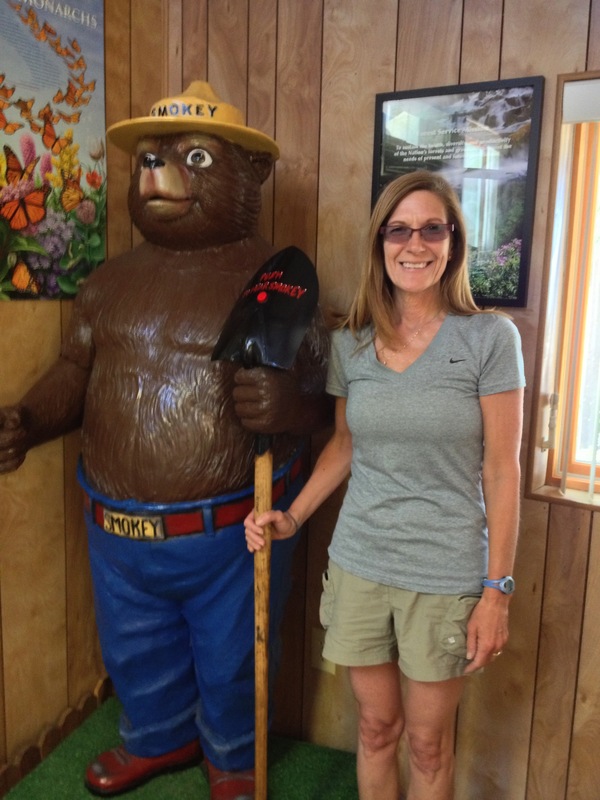 It’s always good to check in with the rangers to get the latest on trail conditions. Also, get an update on the water flows at the creeks and streams. The office is often staffed with volunteers who are a wealth of knowledge. Having obtained the backcountry permit several weeks prior at the Mill Creek Ranger station, we arrived at the Momyer Creek Trail parking area around 0900 on what we expected to be a busy Memorial Day weekend. Altitude at the trailhead is approx. 5,450 ft. This was Mary’s first time out with her new Gregory 60 liter pack, complete with a few days worth of food in a bear canister. While the canisters are not mandatory here, I suggested it to get used to our next backcountry on the JMT where they are required. She has the BearVault 500, and I picked up the Garcia canister. Both are highly rated, and I’ve rented the Garcia type in Yosemite. They are cumbersome and take up a lot of space in the pack, but we just dealt with it. My wife is an amazing hiking partner. She really kicks it on the trail and doesn’t complain a bit. Now that’s a big girls backpack. We began our trek by crossing the Mill Creek Wash, which has two sections of the creek that are fairly easy to cross. The terrain gradually changes from the rocky, sandy wash to a single track laced with chaparral. We passed through several wooded areas before breaking out into the open. You want to hit this section of the trail early because it does get hot by midmorning during spring and summer. The trail begins a gradual climb (around 400-500ft. per mile) with a few switchbacks and moves in and out of deciduous forests. The acorns from the oak trees are among the largest I’ve ever seen. Due to the weight of our packs, we would stop every mile or two for a break. The first water source on Momyer is Alger Creek, about 3.8 miles up. We climbed to 7,300 ft. before dropping into the canyon at Alger Creek Camp at 7,000 ft. Prior to the creek, I noticed a brightly colored snake on the switchback below. Knowing that it wasn’t a rattler and not poisonous, I slowly approached it. It didn’t budge, so I gently coaxed it with my trekking pole and it slithered away. Come to find out, it was a California King Snake. The water flow was decent with several cascades nearby. We dropped our packs, pulled our lunches out and enjoyed a break at one of the cascades. Taking our shoes off, we dipped them into the stream and laughed at how cold it was. We would also spend some time doing our couples devotion. It was time well spent. We noticed a Boy Scout troop pass by. We would see them many more times throughout the weekend. We packed up and began a steep climb out of Alger to the next checkpoint – Dobbs Camp junction. We passed through an area of many fallen trees and a 500 yd. gauntlet of thorn bushes. Long pants are advisable through here. The trail changed from dirt to decomposed granite and became even more narrow as it passed through areas of talus and scree. We encountered a volunteer trail crew pushing blow-downs off the trail. The trail crew leader politely asked for our permit and I obliged. Once he knew we were frequent hikers, he tried to recruit us. 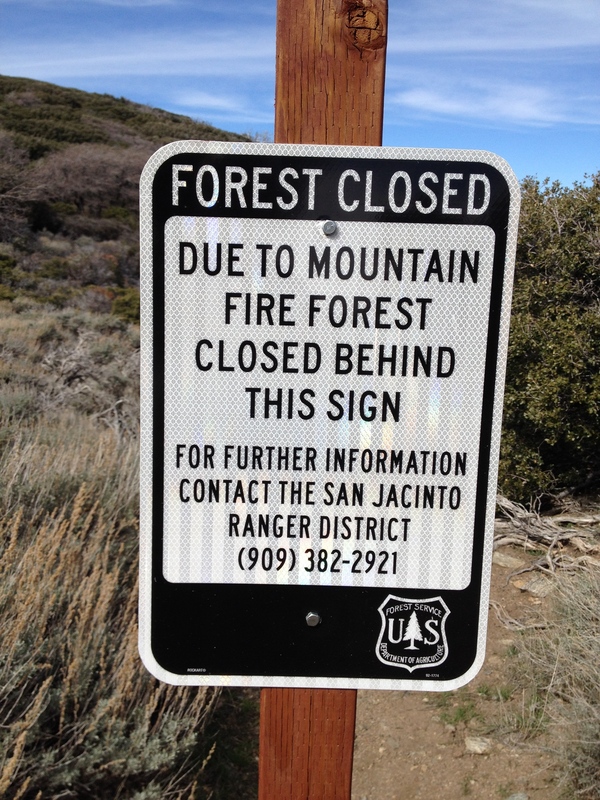 We are thinking about doing some type of volunteer work for the Forest Service, but trail maintenance is tough. 🙂 The one bit of bad news they provided was that the large Boy Scout troop was heading to the camp we were shooting for. Man, I wasn’t looking forward to camping near a bunch of kids, but knew that we could find another site in the forest. It was slow going as we passed Dobbs Camp junction but the views of Little San Gorgonio and Mill Creek Canyon were getting better. Momyer isn’t the most scenic of the trails around here, but is definitely less crowded. 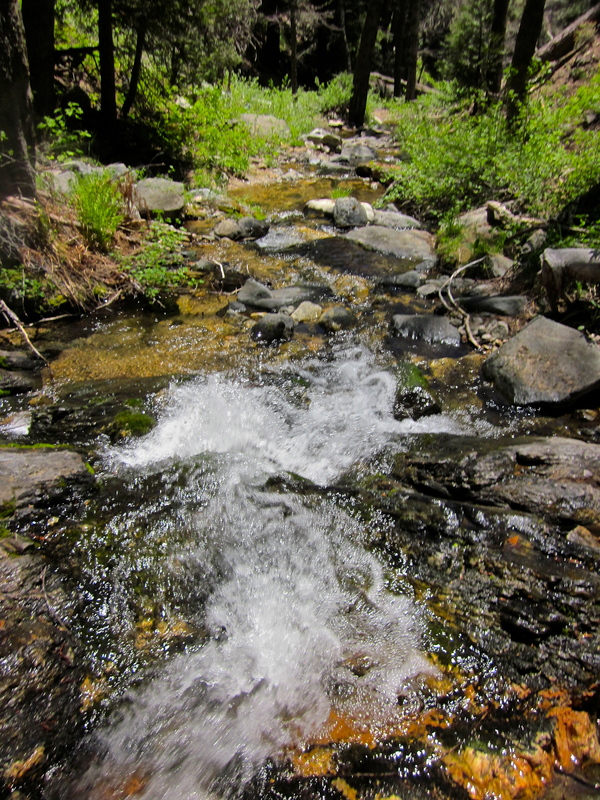 We crossed another trickle of a stream before crossing a larger stream near our destination. It ended up being 300-400 yards before our site. As we neared Saxton Camp, I saw a clearing in the woods downhill. We bushwhacked to the area and found a semi-level location. There were some smaller widow-makers nearby, but the weather forecast was looking good, so it was a risk I was willing to take. We pitched our tent and set up for the night after hiking 6-7 hours. It was a long 7 miles today. 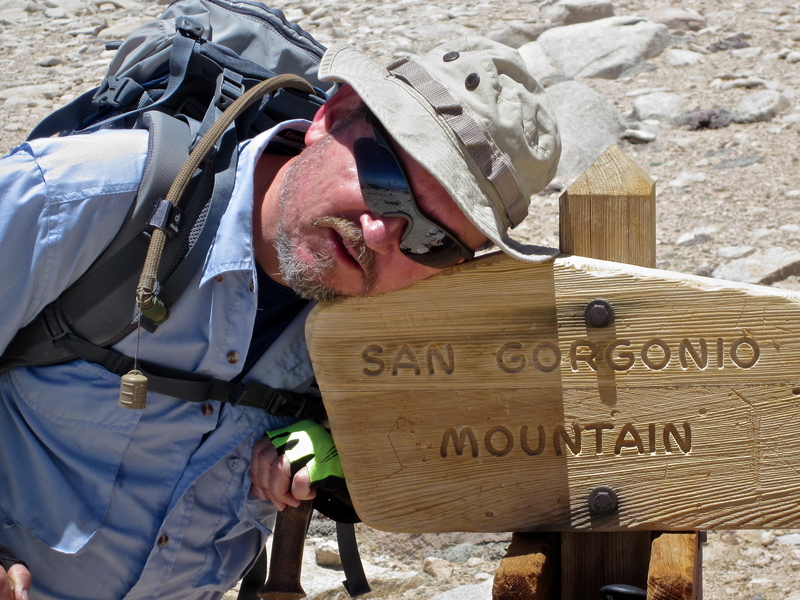 Next: Mount San Gorgonio- A Three Day Journey – Day 2: Lost Hiker! Approximate elevation: Trailhead-5,500ft., Top of trail-9,200ft. Did a spur of the moment hike back to San Gorgonio on a day off. 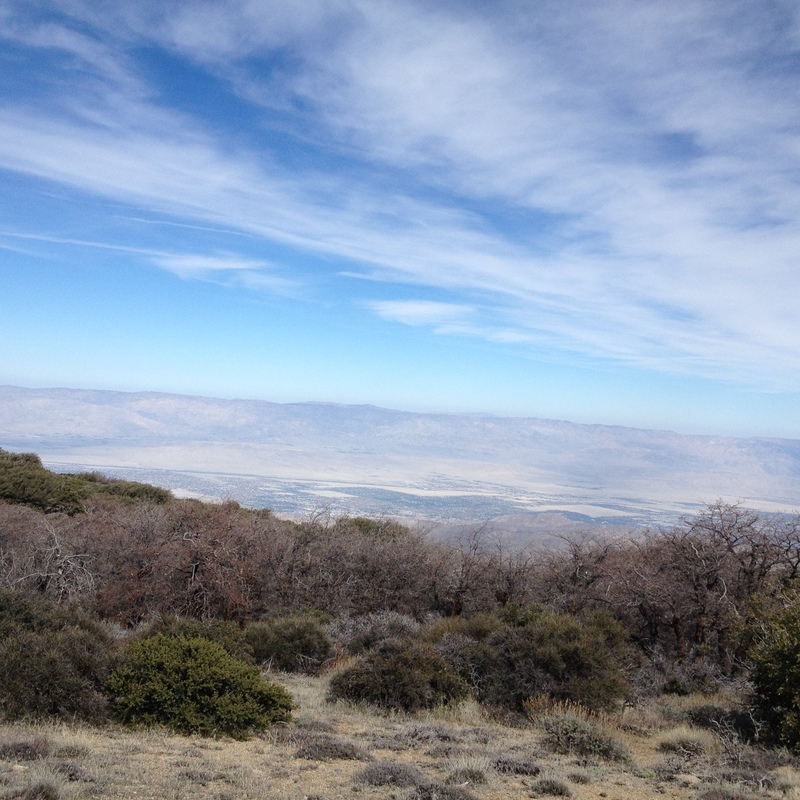 A couple of weeks ago we did the Lost Creek Trail and discovered the solitude of a little used trail that intersects a few others prior to the summit of San Gorgonio. According to the San Gorgonio Wilderness website www.swga.org, the Vivian Creek Trail is the second busiest after the South Fork Trail. On this weekday, I would come across 8-10 others and several more in the Halfway Camp. View in to Mill Creek Canyon from Vivian Creek Trail. Pass through the little hamlet of Forest Falls and the road ends at a picnic area, which was still closed – perhaps to state budget cuts or an ongoing renovation. You will need an Adventure Pass to park in the large parking lot on the left. From there you can follow Mill Creek Wash east along the bank and you will see the trail sign come up on your right. Otherwise, you can follow the paved road in the picnic area east and you will come to the same trail sign. 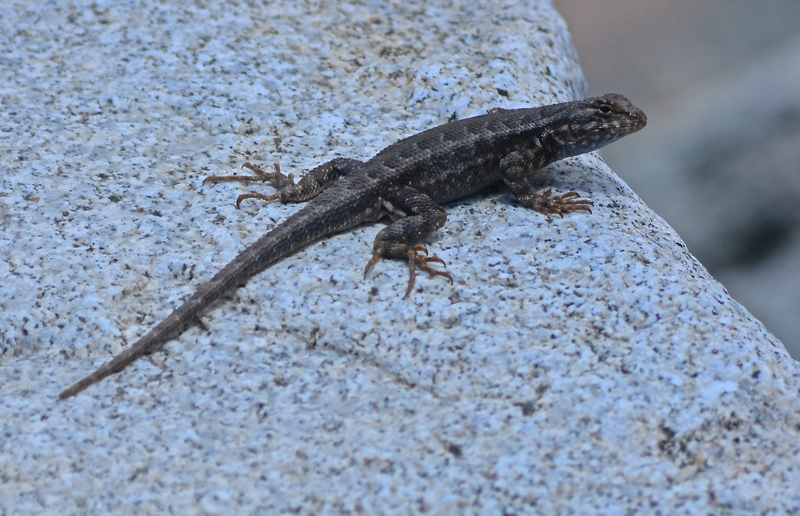 This lizard has his own chunk of granite. Look how long the claws are. The trail begins on an access or fire road for approximately .5-.7 miles and turns to the left where you are looking at Mill Creek Wash. The wash is approximately 300 yards wide, full of boulders with Mill Creek running on the north side. Today, the creek was barely two feet wide. On the far side of the wash, there is another trail marker where you quickly gain elevation on steep, rocky switchbacks. The gnats were annoying and continued to sporadically pester me for another mile. Around 7,000 ft., they thinned out and the hike became more pleasant as the view opened up to Mill Creek Canyon and points farther south. 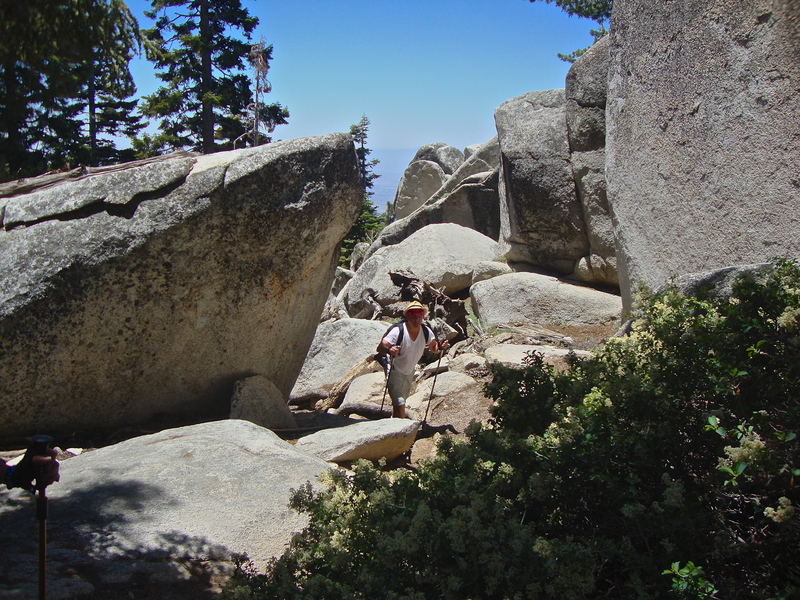 This trail is one of the shortest (and steepest) routes to the summit of San Gorgonio. Today, I would do 5.5 miles of the roughly 9 mile hump to the summit. 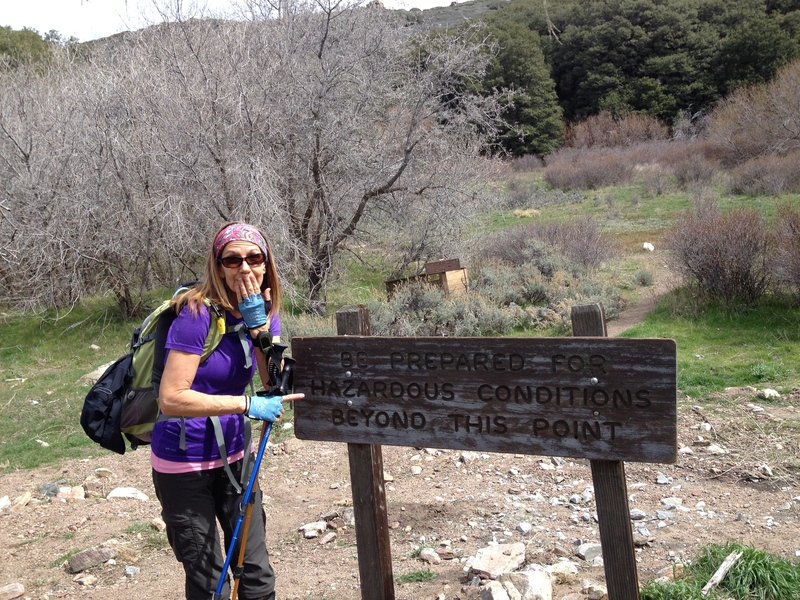 Not yet a speed hiker, I enjoy the eye candy (the wilderness views) and took a steady pace with stops to snap pics. Overall, the trail is single track and in good shape due to its’ frequent use. It traverses a rocky wash with lots of shade from various conifers. There are exposed areas with chaparral as well. I crossed several areas with decent water flow, each several miles apart. As always, recommend a filter to ward off the giardia and cryptosporidium. Man, that last bug sounds nasty, doesn’t it? I’ll talk about hydration in a future blog. 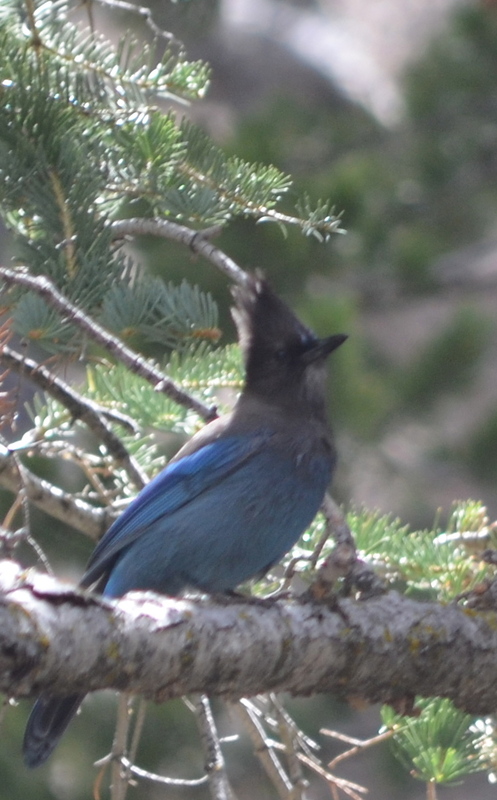 Steller’s Jay, a frequent companion on my hikes. I stopped at the spur to Halfway Camp and had lunch on a boulder. No one in the camp yet, but people usually start settling in late afternoon. I wonder if the feds have a mandatory check in time for these camps? 🙂 The trail breaks in and out of small flats with dry creek areas. A mix of chaparral and deciduous trees slowly starts changing into mostly conifers. 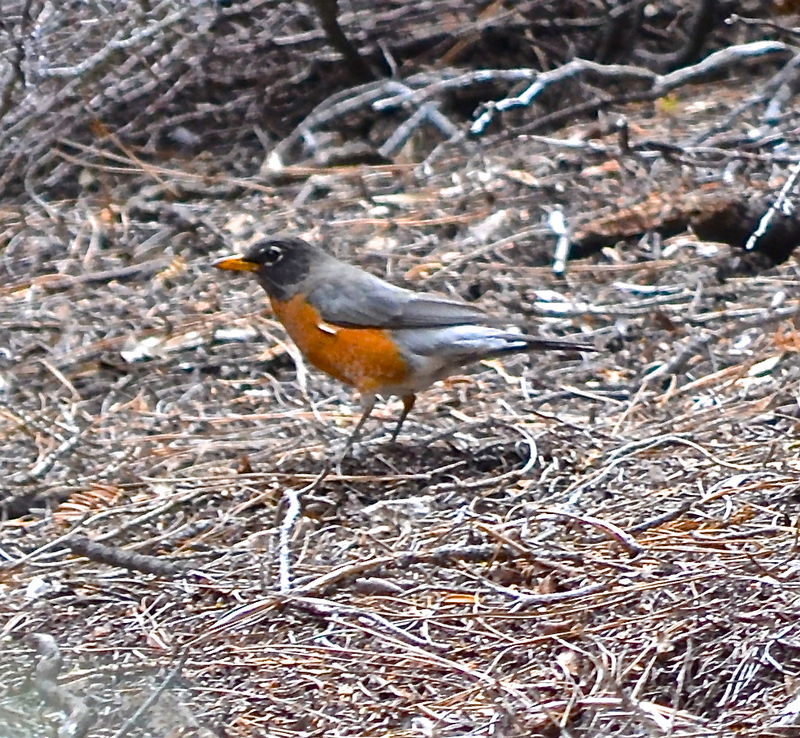 The landscape in this area varies immensely between 6,000-8,000 ft.
After I heard a rock slide, this guy showed up. About two hours into the hike, I heard a rock slide that sounded like it was to my east, but the way sounds bounce off the canyon, wasn’t sure. Within 30 minutes, a helicopter was flying around near Mill Creek but I never did find out what happened. Not long after this trip, several guys from north county San Diego got lost off of Fish Creek Trail for a couple of days. Seems that these “experienced” hikers got turned around after they traversed a snow-covered gully. I will not make fun of them, it could happen to anyone, right? Next time bring a map or GPS fellas. After hitting 9,000 ft. and reaching High Camp, I decided to take a break and head back down. Most of the time, I’ll take my shoes/socks off to air out before turning around. On longer treks, it’s a good idea to do it a couple of times each day. I’ve managed to avoid blisters with this regimen. 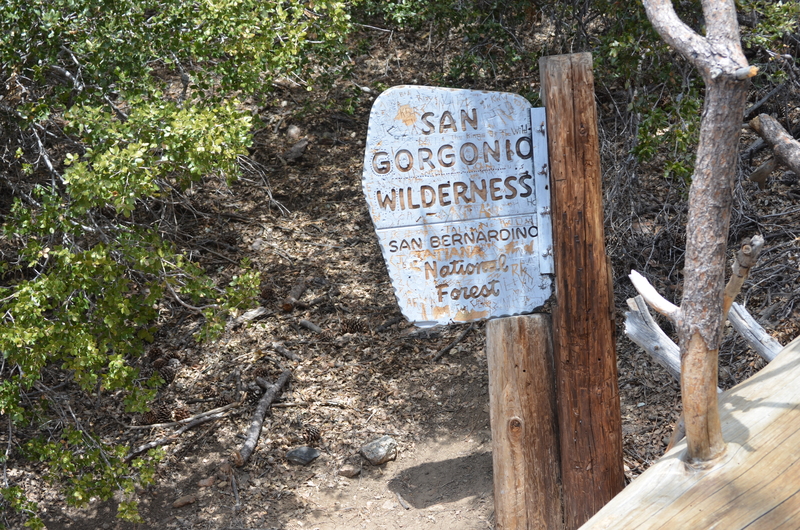 Gorgonio Peak is certainly do-able in one day via this trail with an early start for a determined hiker. Still some patches of snow above 7,000 ft. in early May. I heard quite the ruckus and peeked under this rock. Do you see what I see? On the way down, I met a couple doing a 2 or 3 day trip to the peak. You meet the nicest people on the trail. Most are laid back and enjoy sharing their experiences with you. I ended up jogging for three or more miles until I hit the rocky part of the trail near Mill Creek Canyon. It was a good workout as my knees reminded me that I was no longer 18 years old. This is a good trail if you are practicing for a High Sierra trip, as the elevation change and trail conditions are similar. Type of trail: Out and back, composition: sand, decomposed granite, soft soil. Approximate elevation: Trailhead-6,300ft., Top of trail-8,200ft. 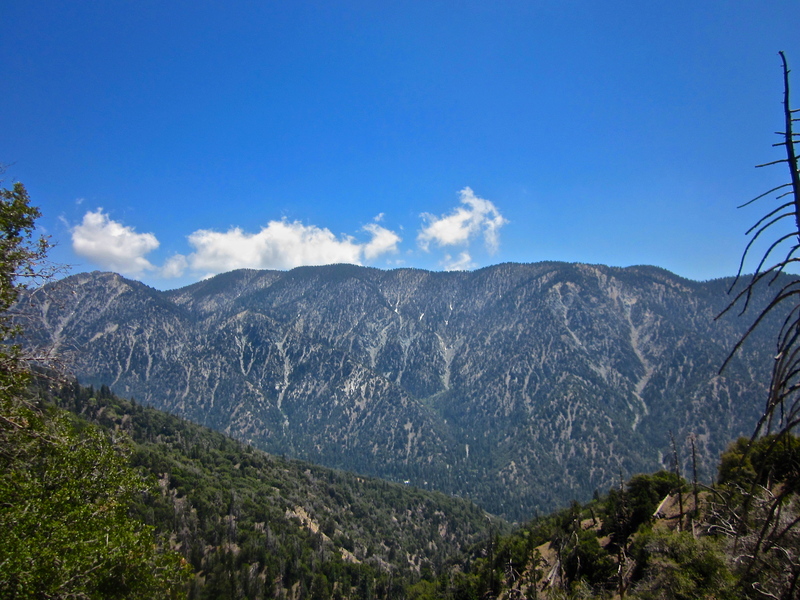 Today, we would venture out farther from home and drive the 90+ miles to check out the trails in the San Gorgonio Wilderness (SGW). 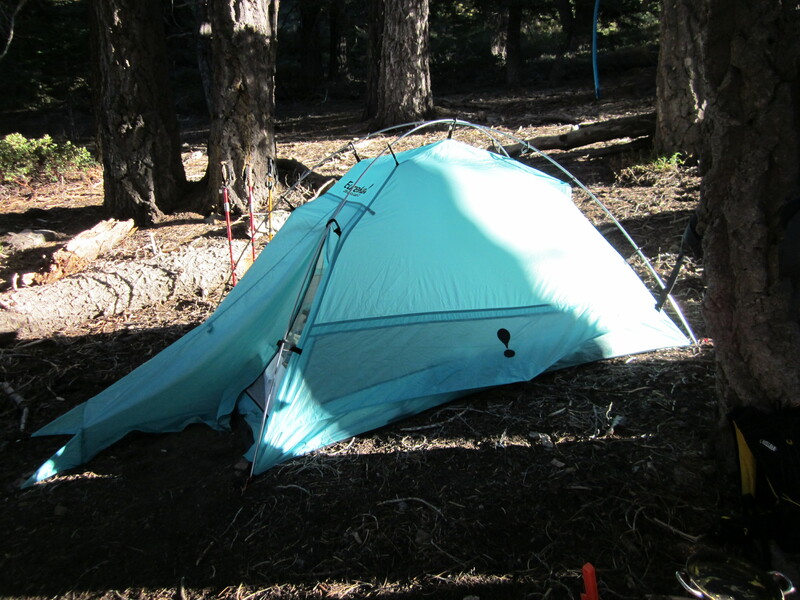 While a day hike to San Gorgonio Mountain is possible, it would be a very long day for us and is better attempted as an overnighter. All trails in the SGW require the perfunctory wilderness permit, which can be obtained by stopping by in person at one of several ranger stations, via fax or by snail mail. Follow the swa.org link above for permit directions. I’ve become a bit of a purist and believe trail permits are government out of control, but I am a rule follower. We stopped in after noon to obtain our permit at Mill Creek Ranger station. While inside, Mary met an old friend and insisted that I take their picture. From Mill Creek, follow SR38 to the South Fork Campground. 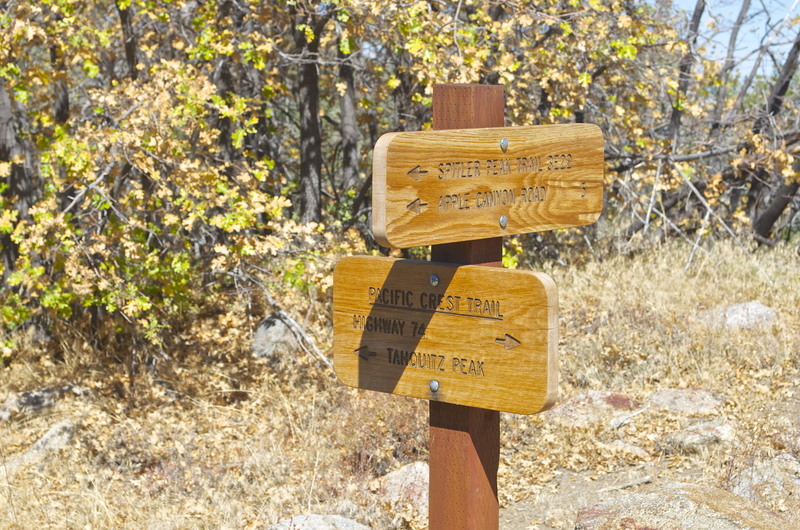 Parking for the trailhead is across the road from the campground and is co-located with the Santa Ana River Trail. 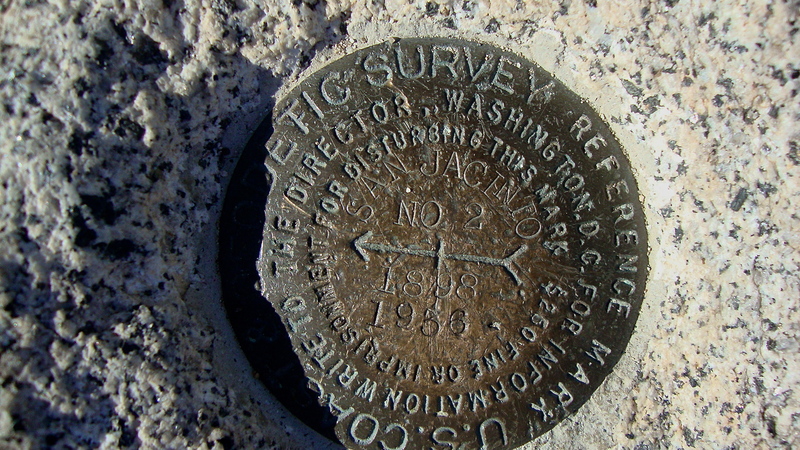 It is fairly well-marked and breaks off at a marker in the campground. The trail wastes no time gaining elevation over switchbacks that gain 400-500 ft. The trail joins a fire road for a mile and changes to a wide creek bed laden with rocks before narrowing into a rutted single track. Evidence of recent equestrians is scattered along the trail. 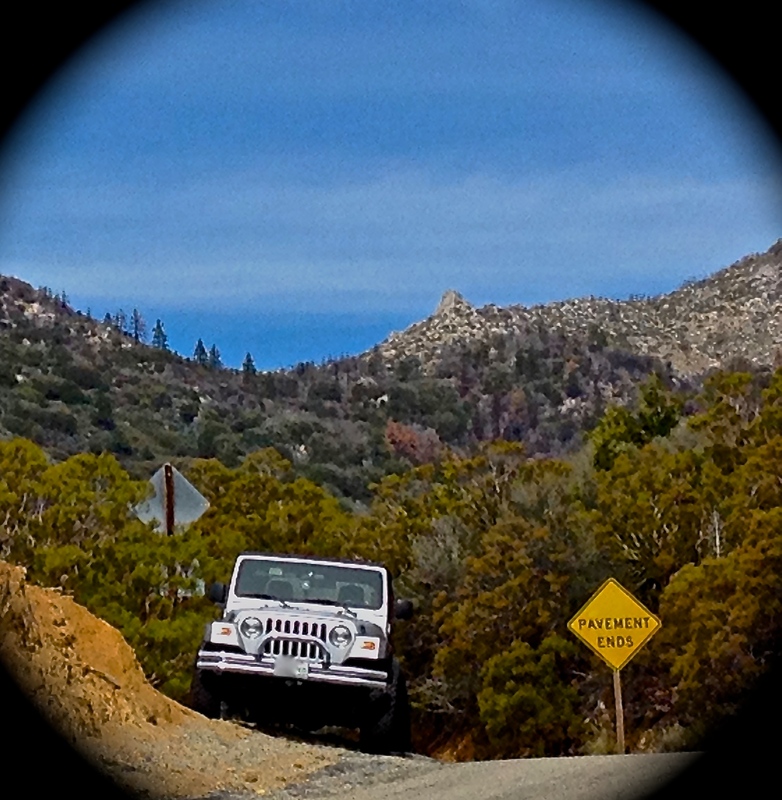 This is one of the most interesting and diverse trails that we’ve been on in the San Bernardino National Forest. 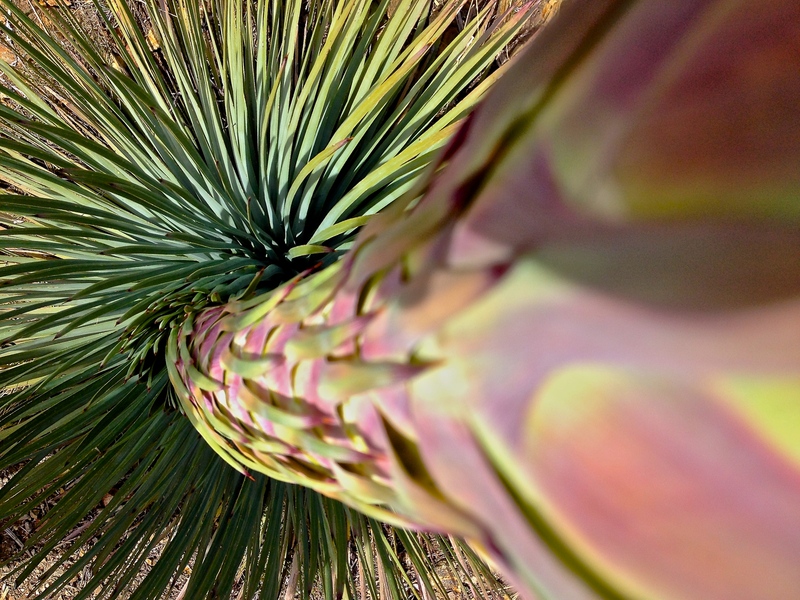 We traversed areas with deciduous trees, rounded a corner and saw cactus on the verge of blooming. As we crossed the top of a meadow, we saw an area of seasonal springs. There were a few blow-downs and widow-makers throughout the hike. At times, the trail became narrow with sheer drop-offs into the Santa Ana River canyon below. Overall, the climb was gradual with few switchbacks and limited scree to slip on. Pine straw does cover sections of the trail and is a bit slippery. On a side-note, the PCT skirts many of the trails in the San Bernardino Forest and is located less than 10 miles east of this trail. 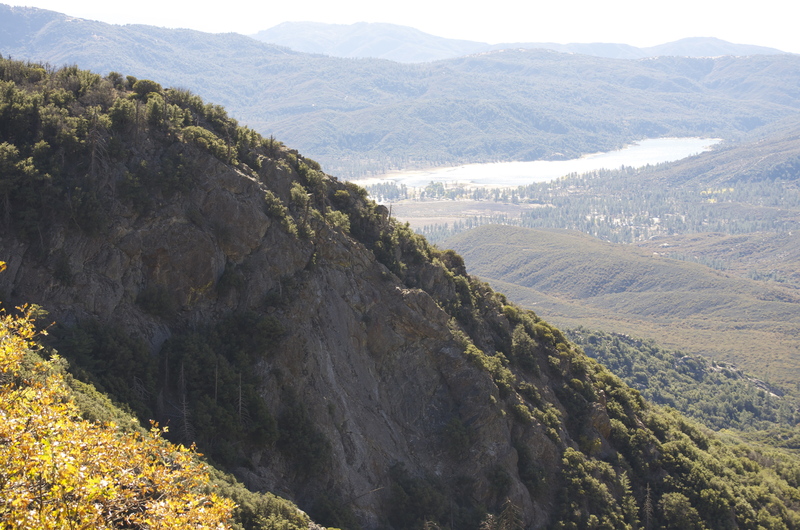 For the first couple of miles, Sugarloaf Peak to the north is the prominent land mass and the perspective changes as you pass through 7,000 ft. Eventually, the path takes a 180 and you head in an easterly direction with views of snow-covered peaks to the southwest. 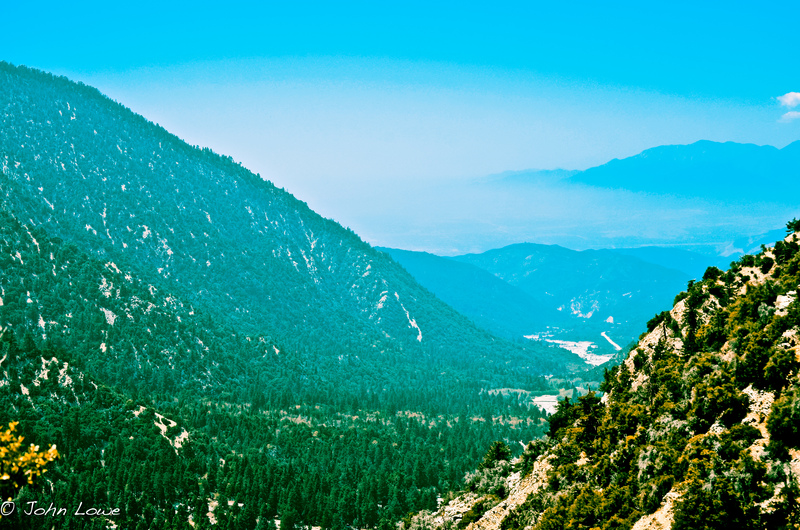 For this area in southern California, I believe the best altitude for hiking is between 6-8,000 ft. The temps are usually mild and the sub-alpine surroundings offer respite from the sun. This trail is especially appealing due to the solitude. We would run into only one other couple all day. We stopped at Grinnell Campground, an open area with awesome views to the south-southwest. It was peaceful and we enjoyed our hot tea. When hiking 8-10 miles, it’s a good idea to cool your jets by removing shoes and socks to allow for some air to dry out those puppies. Our descent was quick with minimal stops for photos. Rounding a switchback, we did see this in the distance and like most hikers is one thing you don’t ever want to see. Notice the smoke was blowing in our direction. 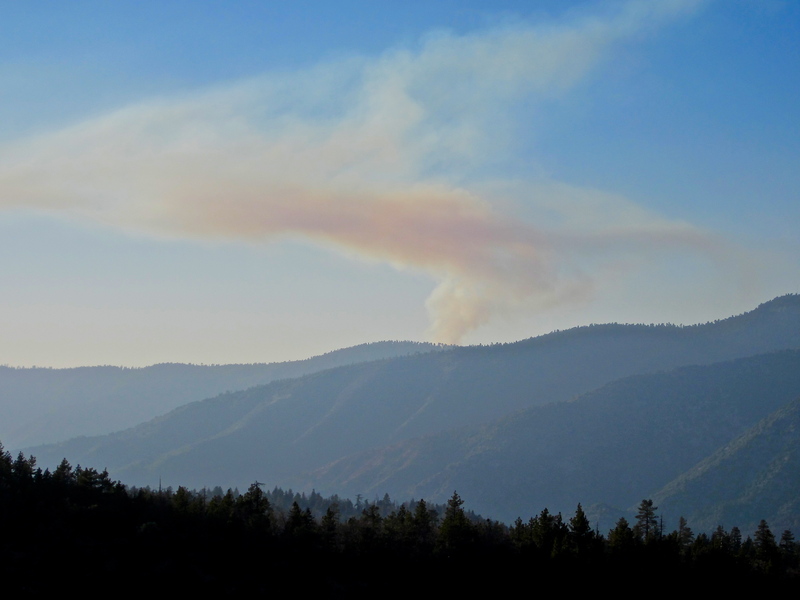 Fawnskin fire, about 16-18 miles away. A fire in the backcountry is a scary thing. 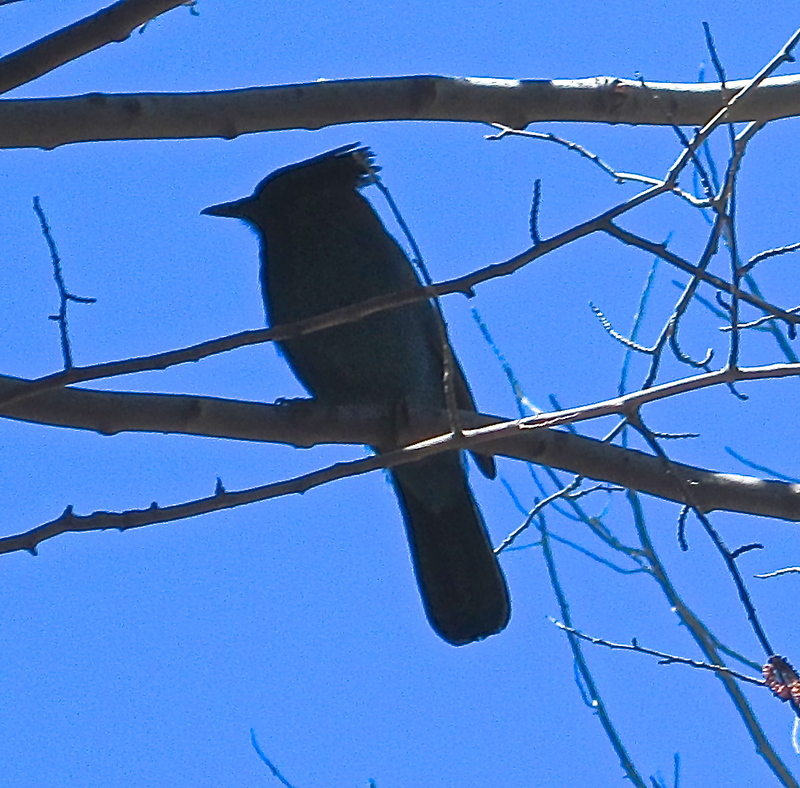 Fortunately, this one was far enough away and we were only a couple of miles from the trailhead. Cal-Fire had it contained within a few days. If you hike frequently in this region, you know how much fuel is on the ground. Fires can be swift and devastating. It’s a good idea to talk about an escape plan and how you would deal with a fire when out on the trail. Trail maps and/or knowledge of the local terrain is invaluable and can make the difference between life or death in a forest fire scenario. – In fire situations, avoid canyons and ravines as fires often ravage these areas. – Consider a GPS locator for emergency situations. I use a SPOT GPS Messenger. SPOT 3 Satellite GPS Messenger – Orange While there is no guarantee that it works 100% of the time, it operates consistently if used properly. There are other higher quality GPS locators out there. – On day hikes, take extra water and snacks – just in case. This week, several more novice hikers got lost in SoCal. Fortunately, all were found quickly. None of them had water or food for their unplanned overnighters. 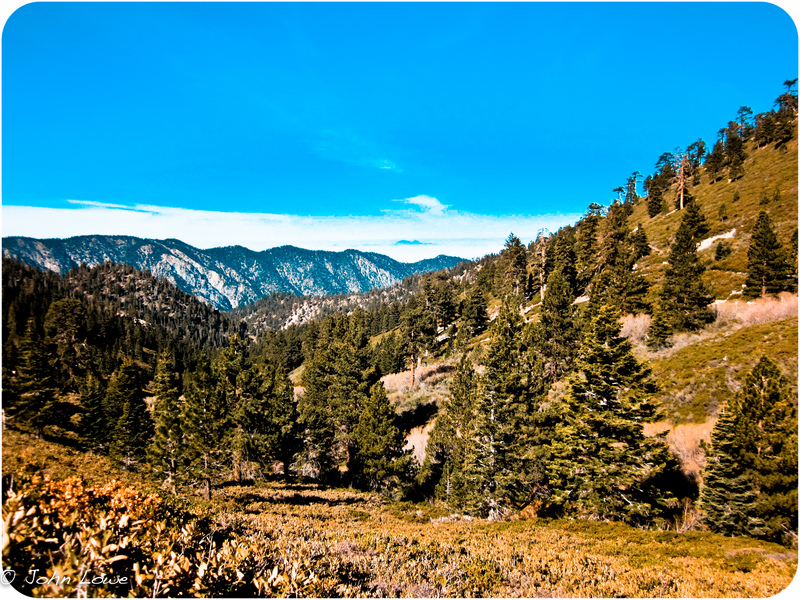 Autumn is a great time to hike in the San Bernardino National Forest. 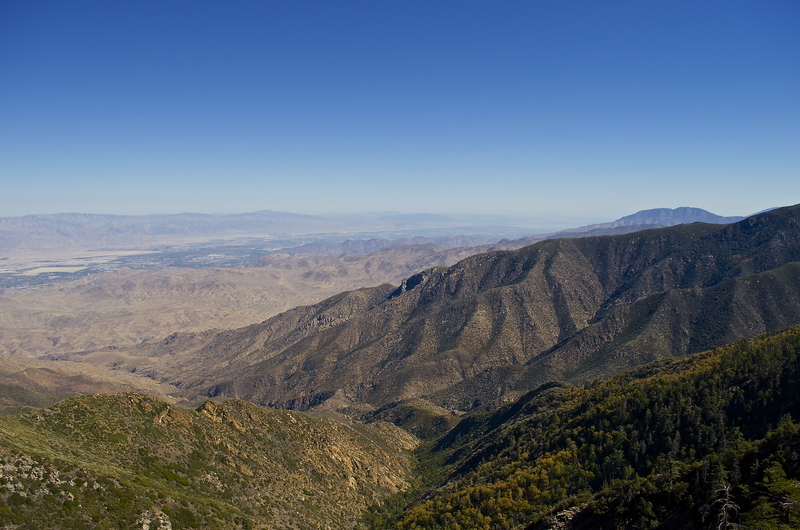 The cool mornings and eastern winds from the Anza-Borrego make for great trekking weather. 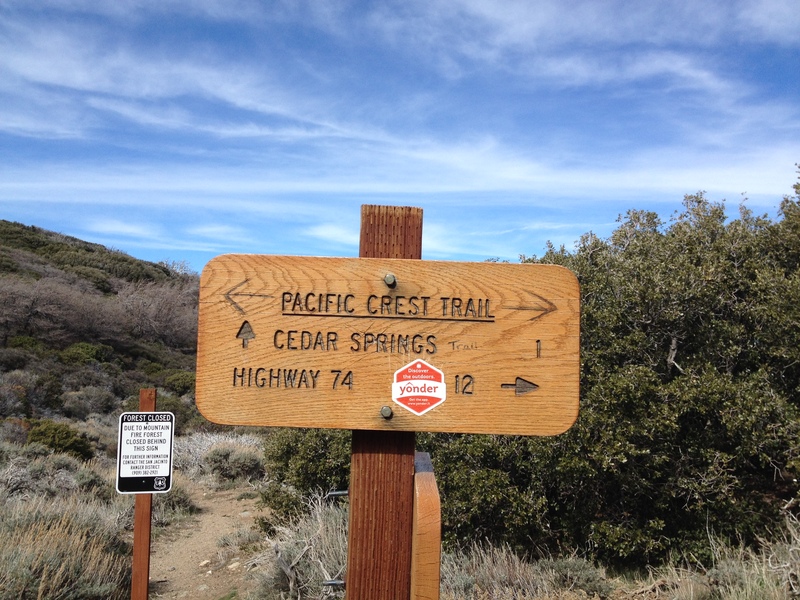 There are many trails that intersect the Pacific Crest Trail in southern California. 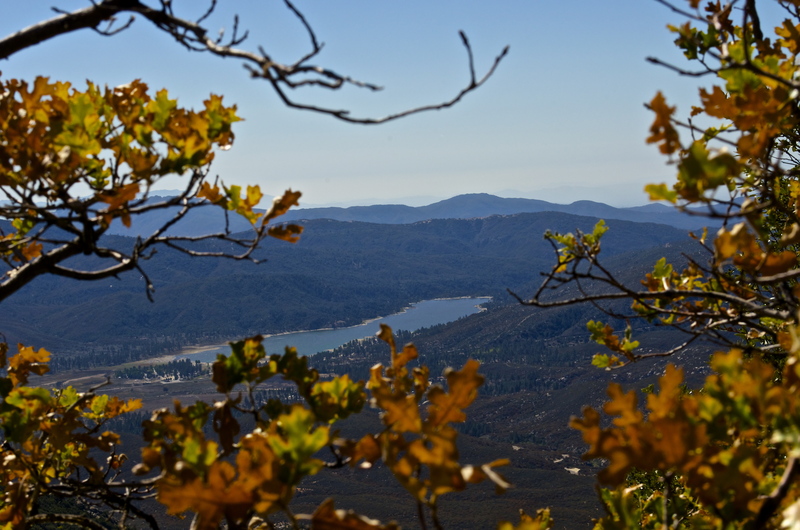 Today, I would do a solo hike on Spitler Peak Trail, a 10 mile out-and-back near Lake Hemet. While I prefer to hike with my wife, occasionally I venture out alone when she is working. It really is a different experience when one can get away from the hustle and bustle to soak up some nature. Hiking gives you the opportunity to use all of your senses. In my previous career, I was an airborne sonar operator in the Navy. I spent countless hours listening to the underwater sounds and tuned my hearing to pick out the manmade noise from the ambient and biologic sounds. Often, I would close my eyes to “see” what I was hearing. On this trek, I focused on the sounds on the trail. Wind blowing through conifers is distinct sound. Comforting during the day and eerie at night. The same wind through deciduous trees like oak has a lower frequency and often sounds like rushing water. Speaking of water, it was interesting to see a trickling stream up here this late in the year. Crossing the gurgling stream several times on the trail, it would eventually disappear underground as it descended into the canyon. This trail is a gradual ascent and is spread out over 4 miles to the top. Like so many others, the grade sharply increases for the last mile. The quail were clucking out their warning calls to each other as I passed by. The bushes rustled a few feet off the path and I stopped. After so many miles on the trail, a shuffle in the brush still makes the hair rise on the back of my neck. No snakes today, hopefully they have settled in for the season. Nearing the summit, you begin to see blue skies through the foliage. This particular trail intersects the PCT just north of Spitler Peak. The trail signs have recently been replaced. At the top of the trail, you are rewarded with awesome views of the Palm Desert. To the left, you can see what may be the outer limits of Palm Springs. To the right, about 40-45 miles away, the Salton Sea. But, you really notice the silence. Other than the occasional wisp of the air through the foliage, it is amazingly quiet. The serene surrounding is part of the reason I put myself through a little pain and sweat. 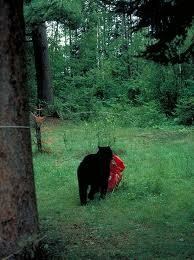 Sitting on the garnet colored boulders, my head began to clear. This is a snippet of the backcountry experience, one where you get away from the sounds of civilization. Even the absence of sound is welcome. Oh well, enough of this peaceful stuff. This late in the year, the days are shorter and I knew that I wanted to be back to the car by dusk. Heading down, my thoughts turned to the sounds. In my experience, other than the shuffling of my feet, the animals on the trail make most of the noise. The chatter of the various birds, the occasional hawk and if you really listen, the rare hoot of an owl who is waking up. The ground squirrels and chipmunks who sometimes fuss as you stroll by. At the end of the day, the steady symphony of the crickets remind you of the cool night that is soon to arrive. Next time on the trail, slow down, stop and listen. What you hear may just surprise you.